Monster Hunter games are legendary for their obtuse design and complexity, as well as their incredible popularity in Japan - which hasn't been mirrored in the rest of the world. 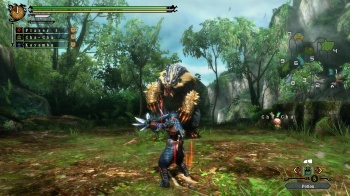 The newly released Monster Hunter 3 Ultimate is, hands down, a huge improvement over any previous game in the series. In fact, I would safely say that it's the best entry point to the series in this generation of games. So if you've decided to spin up your 3DS or Wii U and try to hunt some monsters, this should keep you from getting mauled by dragons. Know that these might seem basic, but that in Monster Hunter nothing is going to teach you to do them - knowing your fundamentals is more vital than in any other RPG. 1. Get to know your weapon. This game is all about picking your weapon, it's like picking your class in any other RPG, and your choice will define your play style for the next hundred or so hours. Over the course of the tutorial, never use the same weapon twice. Change it up constantly, because the game starts you with one of every weapon type - this is your chance to get used to the different options and see what you like. If this is your first Monster Hunter, you probably don't want to use the Bow or the Hunting Horn - they're the most complicated and difficult to master. Save them to try out on your second playthrough. Remember that weapons fall into categories based on how fast you move with them equipped - you're faster with dual blades than with a hammer, for example. Once you've nailed down the weapon you like to use it's time to learn exactly how it moves, what its combos and attacks are like, and how long your attacks take. Especially important is learning what directions your attacks come from, because that's what you'll use to hit particular monsters' weak points. You'll want to know exactly which of your attacks come from left, right, up and down, and precisely how far from your enemy you need to be to damage it. Additionally, learn at what point in your combos you can swiftly transition to a block or a roll - as that's going to be a big help when fighting monsters that suddenly change up their attack pattern. This might all seem very daunting, especially if you're bad at remembering exactly what button does what and when, but don't worry - at most, you'll only have to remember about a dozen possible moves. 2. Read everything. There's all kinds of information about what items, skills, and consumables do hidden inside those innocuous little text boxes. What would in other games be useless flavor information is instead vital to your success in the Monster Hunter universe. The purpose of a dung bomb, for example, is hinted at in its description. You'll also want to read every entry about each piece of armor - knowing which skills and resistances armor gives will really help you out, as well as let you know whether or not you want to craft a full suit of that armor for the stacked bonus the complete set gives you. This applies to NPCs in the village, just as it does with items. They'll drop all kinds of helpful hints about the various monsters you're about to fight. The chief and his son, Junior, are especially useful for getting hints about the kinds of attacks and resistances enemies you're preparing to face might have. 3. Don't neglect the Farm, Fishing Fleet, and Traders. As you move through the single player story you'll unlock and upgrade the Moga village infrastructure, giving you access to plenty of people willing to produce items for you - so long as you take the time to assign them. Make sure you're checking the village status screen after every mission, so that you know when someone is idle. Assign everyone new tasks as soon as they're done, and send everything they make to the stockpile. Remember, each hunt you go on is a day, and it usually takes less than five days for any given task to complete. That's really all there is to it, but having others do your farming keeps you from having to go out into the woods for herbs and mushrooms, or go fishing yourself. Have the farm make things you've only got a single digit supply of - because you're going to need it eventually. Send the fleet to wherever the captains' advice box says to go - you'll be rewarded with an increased haul. If you turn any excess items into resource points for the village, then the activities of your fleet will more than pay for whatever you're growing at the farm. Be very sure to keep any item labeled as a commodity, however, because you'll want to use it to trade with the Argosy trade ship captain. The Argosy doesn't bring many things that are unique, but it does bring a lot of things that are time consuming to get otherwise.